The Nokia Lumia 510 has a 5MP camera, that can produce still photos with a maximum resolution of 2592x1944 pixels. There is no LED flash to assist its low-light performance, though, so it's only usable in decent lighting. The camera UI is pretty simple - you have your viewfinder and some controls on the right. From top to bottom they are the still/video camera toggle, virtual zoom buttons and an extended settings menu. On the left you have an arrow that takes you to the gallery. Alternatively, you can do a swipe gesture too. The camera app on Windows Phone offers very extensive settings, ranging from scenes and effects to white balance, contrast, saturation, sharpness, ISO and more. You have a dedicated Macro mode but no face detection. The camera key will wake the phone with a single press - that is unlock it and start the camera. There's an option that prevents the shutter key from starting the camera if the proximity sensor is triggered (to prevent accidental launches when the phone is in your pocket). This option is off by default. We like the shutter key on the Nokia Lumia 510. It's got good feedback and distinct half-press. The quality of the shots produced with the Nokia Lumia 510 camera is excellent. There is plenty of resolved detail, accurate colors, low amount of noise, no artefacts, over sharpening or any kind of defects. Excellent job for a low-end device! Here are the full-res images for you guys to check out. The Nokia Lumia 510 steps up in our photo quality compare tool to face other 5MP shooters. It does really great job and puts to shame lots of 5MP snappers out there. The camcorder interface is identical to the still camera's and has plenty of features too. You can use scenes, set contrast, saturation and sharpness, change the white balance or exposure compensation and also apply image effects. However, the Nokia Lumia 510 can only shoot VGA videos, which just doesn't cut it anymore. There are even cheaper devices out there that do 720p, so there's no excuse for this. The fact continuous autofocus is available while recording might be some consolation, but it can't change the fact that the Lumia 510 should only be used for video capture in emergencies. We've prepared an untouched VGA video sample from the Lumia 510's camera for direct download. The bitrate is a low 1600 Kbps, but that was to be expected given the resolution. 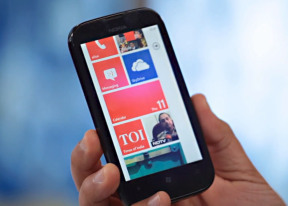 The Nokia Lumia 510 has quad-band GSM/GPRS/EDGE support and quad-band 3G with HSPA. The local connectivity is covered by Wi-Fi b/g/n with DLNA and stereo Bluetooth 2.1. The Counters app, which premiered on Windows Phone 8.0 is available for 7.8 as well. There you can track your minutes and megabytes. You can set limits to avoid using anything out of your plan. The Bluetooth file transfers are here as promised. The Bluetooth Share app is in charge of those. Unfortunately, since there is no wide-spread file manager in Windows Phone 7, nor is there USB mass storage support, you can send and receive a very limited variety of file types. The supported formats are JPG, BMP, GIF, PNG and MP3. From those you can receive only JPG and MP3, while the BMP/GIF/PNG ones are automatically converted to JPG on arrival. You can only send JPG files from the gallery or the Bluetooth Share app and MP3 files you've already received or synced with your Zune software. There is another disadvantage - if you receive an MP3 file without metadata, you will not be able to transfer it later on your computer via Zune. Bummer! So, even though you can exchange files via Bluetooth, the restrictions are so much that will frustrate lots of people. You can't share or receive Office files. In fact you can receive any kind of files, including Office format, but the app will just tell you they are not supported and you will have no other choice but to delete them. According to the app logo, it's made by Nokia, so we aren't sure if it will be available on other phones (like the Omnia W), or the other manufacturers will have to developer apps of their own. Syncing with a computer is done with the Zune computer application. It's the only way to transfer files directly between your computer and your Windows Phone - there's no Mass storage mode even after the 7.8 update. You can sync files with Zune over the USB cable and Wi-Fi. There's a Mac version of it available too - Windows Phone 7 Connector. Additional SD storage isn't available on Windows Phone so the Lumia 510 doesn't offer such an option. Another syncing option is the cloud. SkyDrive is a free Microsoft service that gives you 7GB of cloud storage. You can even have your photos automatically uploaded as soon as you snap them. There is Wi-Fi hotspot functionality. All you need is an active SIM card with a data connection and you're all set.